Born in London, Mary studied at Central School of Art from 1935-37 (at that time known as Clapham School of Art) then went on to the Central School of Arts and Crafts from 1937-39. 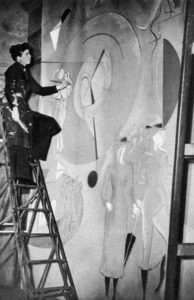 This photograph from ‘The Sketch’ weekly journal in March 1938 shows Mary working on a mural painting for the Shell BP Pavilion at the Empire Exhibition in Glasgow, so we can see she had an association with Shell from an early stage of her career. 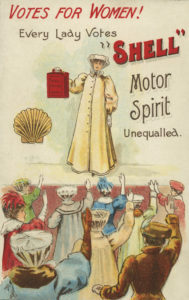 The innovative policy to commission emerging artists rather than graphic designers for the Shell poster series and other commercial work was created by Jack Beddington, Publicity Manager of Shell at the time. He was credited with making Shell a patron of the arts by supporting the early careers of fine artists through providing paid, commercial work. In her career Mary worked across disciplines as a painter, book illustrator, designer and like many other Shell artists, as a war artist. She was one of only three female war artists selected and became known for her charcoal drawings of war refugees, mostly women and children and survivors of the concentration camps. Post war Mary was commissioned to create experimental designs for hand and machine embroidery work for the Needlework Development Scheme with the aim to initiate a new standard for British embroidery design. Shell commissioned Mary to paint the landscape Arlington Row, Bibury for their 1952 poster and she went on to design the 1964 poster ‘Kew Gardens’ for London Transport too. Mary lectured in drawing at the London School of Printing from 1957 and also the Central School where she worked alongside the painter Richard Hamilton. In 1966 Mary married the designer Tom Eckersley who had, in the late 1930s, also produced posters for Shell in collaboration with Eric Lombers. 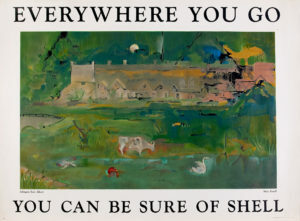 The Imperial War Museum, Tate and Victoria and Albert Museum all hold works by Mary Kessell in their collections.